The part of a building that sits immediately on the natural ground, rock or compacted fill. The base that supports the building. A base for machinery. Usually all or part is below ground level. Also called footings. The building term "foundation" has spread throughout general language meaning many things, but the same basis remains, it is a start, it is the base that all else depends upon. To make a good start then the foundation must be right. For most of our history foundations have been built out of bricks or stone sat on top of compacted earth or rock. The basic principal is to spread the load to a wider base. As you can see from the photo above the idea sometimes fails, but don't be too soon to judge. 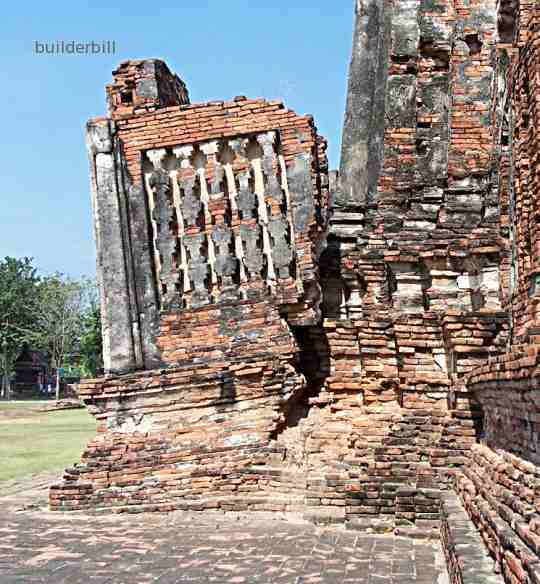 The building in the photo has been standing in the old Thai capital of Ayuttaya for about 600 years before the first engineers devised methods of determining the load bearing capacity of soils or the compressive strengths of clay bricks and mortar. There are many old houses standing today that do not have any other foundation than what is shown at the right, a widening of the base of the brickwork on the compacted (hopefully) soil. In many cases the foundation brickwork was as "rough as guts" with broken and odd shaped bricks and random masonry used. It used to be common to lay the mortar with a shovel as the brickies tried to get a good tally when working on piece work. One of the main reasons that many of these old crappy foundations are still doing their designed jobs is that the brickwork or masonry was laid using lime mortar which is a lot more flexible and forgiving of movement than our modern cement mortars. Modern foundations are almost exclusively made out of reinforced concrete. 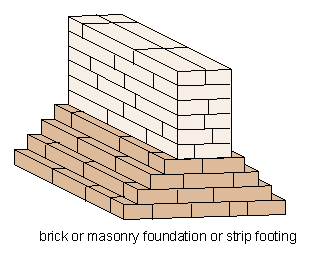 There are quite a lot of types of foundations and also combinations of various types used on the one job.